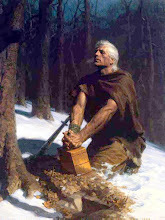 The Book of Mormon contains many references to either the process of metallurgy or to items that were created through the metallurgic process. Yet there is no archaeological evidence that ancient Mesoamericans possessed the skill of metallurgy during the Book of Mormon time period. Is the "absence of evidence" really evidence of absence? What metal artifacts have been discovered in ancient Mesoamerica? Could the "swords" in the Book of Mormon really be an atlatl or macuahuitl? What verses in the Book of Mormon explicitly refer to the process of metallurgy? What were the breastplates and armor described in the Book of Mormon? What is the difference between simple metalworking and metallurgy? Does the Book of Mormon's references to gold correlate with the use of gold in ancient Mesoamerica? What did early church members like Oliver Cowdery "see" in Hill Cumorah? What is the general history of metallurgy, and how can we detect it in ancient cultures? What kind of heat is required for metallurgy? Is there linguistic evidence in ancient Mesoamerica for metallurgy? How are metal swords described in the Book of Mormon? Did ancient Mesoamericans use simple metalworking or metallurgy? What metal Nephite artifacts did early church members see? Can we detect the presence of any process or technology in ancient Mesoamerica? Do the precious metals described in the Book of Mormon correlate with precious metals from ancient Mesoamerica during the specified time period? What evidence is there for smelting in the New World? What about John Sorenson's claims that there is archaeological evidence for metallurgy in ancient Mesoamerica during the Book of Mormon time period? What tools did the ancient Mesoamericans use?